So now that you’ve finished dying eggs naturally using onion skins, what do you do with all those onions? Make French Onion Soup, bien sûr! 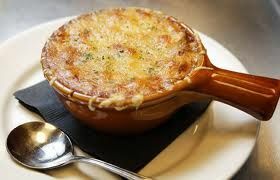 French onion soup in France is served as the traditional French farmer’s breakfast or the end of the day repast for the late night café and theater crowd. It was made famous in the great open market of Les Halles in Paris where hungry truckers converged from all over France with their fresh produce. On my first visit to Paris in 1966, I made a late night visit to Les Halles with some friends to savor the tradition and practice my very rusty college French. The truckers and waiters in the little café we “invaded” were quite friendly and chuckled as they good heartedly corrected my pronunciation. Needless to say, je parle français bien mieux maintenant. Les Halles was torn down in 1971 and replaced with a modern shopping area, the Forum des Halles. But I digress, we are here for the food. My favorite recipe is from Bernard Clayton, Jr.’s The Complete Book of Soups and Stews with some variations. It is from a restaurant near the Halles Metro station. M. Calyton’s version uses a hearty homemade beef stock which is time consuming to make. I found that either Swanson’s or College Inn Beef Broth produces a good result, just reduce the salt. The low sodium broth didn’t produce the hearty broth that’s needed to compliment the flavor of the caramelized onions and the cheese. You will need some “special” equipment for this soup: individual oven-proof bowls, enough to hold 1 1/2 to 2 cups. I have the bowls with a handle and a lid that serve double duty for baked beans, and other soups and stews. You will also need cheesecloth for le sachet d’épices, that’s a spice bag for you Americans ;-), and butcher’s twine or some other cotton twine. Those items can be found in the gadget aisles of most large grocery stores. In an extended segment of MSNBC’s “All In,” host Chris Hayes spoke with author and co-founder of “The Intercept” Jeremy Scahill about the claim by Al Qaeda in the Arabian Peninsula (AQAP) that they were responsible for the shooting at the satirical magazine “Charlie Hebdo.” Later in the segment, Hayes speaks with satirical cartoonist, Ted Rall about the limits of free speech and expression. For in-depth analysis of AQAP, Anwar al Awlaki and the Paris attacks, see our previous coverage here and here. Not everyone believes in free speech. I’m not talking about those on the authoritarian right. No one expects them to stand up for the right to dissent. They are ideologically consistent; for them, the rights of the individual always is a distant second to the prerogatives of the state and its incessant campaign to maintain the status quo that keeps them in power. To believe in freedom of expression, to truly defend satire, we must stand up for it unequivocally, without reservation – not despite our distaste for the cartoons or standup routines or humorous essays or films drawing fire from critics and potential murderers, but because they make us uncomfortable. If you can’t compartmentalize, if you can’t refrain from playing the critic even when the cartoons or whatever have gotten their creators blown away by automatic weapons, then you are not with us. You are with them. Well, this didn’t take long. President Barack Obama and Britain’s Prime Minister David Cameron didn’t let any dust settle. Barack Obama plans to announce new cybersecurity measures on Tuesday amid warnings from privacy campaigners about unnecessarily “broad legal immunity” that could put personal information at risk in the wake of attacks like the Sony Pictures hack. The administration believes the legislation is necessary partly to give companies legal immunity for sharing information on attacks so that counter-measures can be coordinated, but the White House has stepped back from suggestions that companies should be allowed to individually retaliate against hackers, fearing such encouragement could lead to an escalation of cyber warfare. A White House statement released in advance of Obama’s speech on Tuesday said it “encourages the private sector to share appropriate cyber threat information with the Department of Homeland Security’s National Cybersecurity and Communications Integration Center”. Britain’s intelligence agencies should have the legal power to break into the encrypted communications of suspected terrorists to help prevent any Paris-style attacks, David Cameron proposed on Monday. The prime minister said a future Conservative government would aim to deny terrorists “safe space” to communicate online, days after a warning from the director general of MI5, Andrew Parker, that the intelligence agencies are in danger of losing the ability to monitor “dark places” on the net. His proposed legislation, which would be introduced within the first year of Cameron’s second term in Downing Street if the Conservatives win the election, would provide a new legal framework for Britain’s GCHQ and other intelligence agencies to crack the communications of terror suspects if there was specific intelligence of an imminent attack. Political approval would also be necessary. They aren’t the only ones leaping on the security train wreck, the French and Italian governments have hooped on board. Following a terrorist attack, it is not uncommon to hear calls from politicians and government officials for increased surveillance. Fear and grief can lead to quick “solutions” that have significant consequences; as we pointed out last week, some of the most far-reaching surveillance and law enforcement powers around the world were devised in the wake of tragedies. Mass surveillance doesn’t only infringe on our privacy, but also our ability to speak freely. As a recent PEN American study found, for writers around the world, surveillance has the effect of chilling speech. The knowledge, or even the perception of surveillance, can prompt writers to think twice before touching upon a given issue. Let us resist attempts to use this tragic moment as an opportunity to advance law enforcement surveillance powers. Freedom of speech can only thrive when we also have the right to privacy. The greatest threat to law enforcement since the motocar continues to receive attention from entities aghast at the notion that peoples’ communications and data might not be instantly accessible by law enforcement. Apple’s decision (followed shortly thereafter by Google) to offer default encryption for phone users has kicked off an avalanche of paranoid hyperbole declaring this effort to be a boon for pedophiles, murders and drug dealers. Mark Jaycox and Lee Tien of Electronic Frontier Foundaton released this statement regarding the president’s proposal. More needs to be done to protect cyberspace and enhance computer security. But President Obama’s cybersecurity legislative proposal recycles old ideas that should remain where they’ve been since May 2011: on the shelf. Introducing information sharing proposals with broad liability protections, increasing penalties under the already draconian Computer Fraud and Abuse Act, and potentially decreasing the protections granted to consumers under state data breach law are both unnecessary and unwelcome. The status quo of overweening national security and law enforcement secrecy means that expanded information sharing poses a serious risk of transferring more personal information to intelligence and law enforcement agencies. Given that the White House rightly criticized CISPA in 2013 for potentially facilitating the unnecessary transfer of personal information to the government or other private sector entities when sending cybersecurity threat data, we’re concerned that the Administration proposal will unintentionally legitimize the approach taken by these dangerous bills. Many of these proposals are old ideas from the administration’s May 2011 Cybersecurity legislative proposal and should be viewed skeptically. While the Administration information sharing proposal may have better privacy protections than dangerously drafted bills like CISPA, we think the initial case for expanding information sharing requires much less secrecy about how intelligence and law enforcement agencies collect and use data on our networks. And instead of increasing penalties under the Computer Fraud and Abuse Act, we’ve long advocated common sense reform to decrease them. Here’s hoping there are enough sane heads left in legislatures to stop this in its tracks, on both sides of the pond. Hackers claiming to be with the group Anonymous say they have hacked a jihadist website in retaliation for the terror attack on French satirical magazine Charlie Hebdo. The website ansar-alhaqq.net, a French jihadist site, currently redirects to Duck Duck Go, a search engine. Hackers using the Twitter handle @OpCharlieHebdo claimed responsibility. Anonymous also named dozens of Twitter accounts that the hacktivist group says belong to jihadists. The hackers posted the Twitter handles on Pastebin, a website that lets people post information anonymously online. The Paris Mystery: Were the Shooters Part of a Global Terrorist Conspiracy? n the days since the siege at the Paris magazine Charlie Hebdo, the press and social media sites have been consumed with the possible answers to one question: Beyond the two shooters, Said and Cherif Kouachi, who is responsible for the attack that killed 12 people at the magazine’s offices? On Friday, shortly after the gunmen were killed by French forces in a raid on a printing plant outside of Paris, a source from within al Qaeda in the Arabian Peninsula (AQAP) provided The Intercept with a series of messages and statements taking responsibility for the attacks, asserting that AQAP’s leadership “directed” the raid on the magazine to avenge the honor of the Prophet Mohammed. Moments after The Intercept published these statements, an AQAP official, Bakhsaruf al-Danqaluh tweeted, in Arabic, the exact paragraphs the AQAP source provided us. Within an hour of that, AQAP’s senior cleric, Sheikh Harith bin Ghazi al-Nadhari, released an audio statement through AQAP’s official media wing, praising the attack. “Some of the sons of France showed a lack of manners with Allah’s messengers, so a band of Allah’s believing army rose against them, and they taught them the proper manners, and the limits of freedom of speech,” Nadhari declared. “How can we not fight the ones that attacked the Prophet and attacked the religion and fought the believers?” While heaping passionate praise on the attack on Charlie Hebdo, Nadhari stopped short of making any claim that AQAP directed or was in any way involved with the planning. Historically, when AQAP has taken credit for attacks, it has used al Qaeda central’s al-Fajr Media to distribute statements and video or audio recordings through the AQAP media outlet al-Malahim to a variety of jihadist forums. But over the past year, AQAP has broadened its distribution strategy and has begun using Twitter and other social media sites. While AQAP continues to use al-Malahim, “the vast majority if not all of the releases are now released onto Twitter first via authenticated Twitter accounts that have become the first point of release,” says Aaron Zelin, an expert on al Qaeda and other militant groups and a senior fellow at the Washington Institute. “This has been the case ever since late July 2014, though AQAP had been making a slow transition going all the way back to early 2014.” Zelin’s analysis of this new distribution strategy tracks with how AQAP sources began to assert responsibility for the Paris attacks last week, with the one caveat being that an AQAP source provided the tweets in advance to a media outlet, The Intercept. In analyzing AQAP’s potential role in the Paris attack, it’s worth remembering the four-month delay between the group praising the 2009 underwear plot and the group releasing evidence it actually orchestrated the act. Short of such video or photographic documentation, and even with an official statement from AQAP’s leadership, it would be difficult to prove that AQAP indeed sponsored the raid on Charlie Hebdo. From the New York Times Op-Docs. In February 2006 the editors of the French magazine Charlie Hebdo met to discuss a matter of what turned out to be deadly consequence: Would they publish a satirical image of Muhammad on their cover? We were making a documentary about Jean Cabut, known as Cabu, one of the most famous cartoonists in France. So we were there, filming his conversation with his colleagues as they chose the cover. The issue that came out of this meeting – with a Cabu cartoon on the cover and the images they discussed here – turned out to be one of the most popular in the magazine’s history. Almost nine years later, gunmen stormed this very meeting and killed 10 editors and cartoonists, including three of the people in this film: Cabu, Bernard Verlhac (known as Tignous) and Georges Wolinski. This morning’s attack on the satirical magazine “Charlie Hebdo“ in Paris, France that killed ten journalists and two police officers was an attack on freedom of the press and free speech everywhere. The revelation that the NSA was using its hoovering of data from other countries broke in August with the Der Spiegel report that the NSA had bugged the UN Headquarters in New York City, as well as, European Union and the International Atomic Energy Agency (IAEA). In early September, a week before the UN General Assembly meeting in NYC, Brazil’s president, Dilma Rousseff, cancelled her visit in Washington with President Barack Obama over the NSA’s spying on her, her inner circle of top aides and Brazil’s largest company, the oil giant Petrobras. French Prime Minister Jean-Marc Ayrault [said] “I am deeply shocked…. It’s incredible that an allied country like t purchase brand levitra he United States at this point goes as far as spying on private communications that have no strategic justification, no justification on the basis of national defence,” he told journalists in Copenhagen. In the space of a single year, according to the internal documents, this operation produced 260 classified reports that http://cinziamazzamakeup.com/?x=miglior-sito-per-comprare-viagra-generico-50-mg-spedizione-veloce-a-Milano allowed US politicians to conduct successful talks on political issues and to plan international investments. As has been revealed this summer, the NSA was recently revealed to have been spying on Brazil’s largest oil company. We now know they were also spying on the biggest financial payments systems such as VISA and Swift and on the on Chinese technology company Huawei. One of the slides leaked by Edward Snowden from from a 2012 NSA presentation explained “economic” was one of the main justifications for spying. Drawing an analogy to how the military detects an incoming missile with radar and other sensors, (General Keith) Alexander imagined the NSA being able to spot “a cyberpacket that’s about to destroy Wall Street.” In an ideal world, he said, the agency would be getting real-time information from the banks themselves, as well as from the NSA’s traditional channels of intelligence, and have the power to take action before a cyberattack caused major damage. The group of financial industry officials, sitting around a table at the Office of the Director of National Intelligence, were stunned, immediately grasping the privacy implications of what Alexander was politely but urgently suggesting. As a group, they demurred. But he was proposing something they thought was high-risk. The hypocrisy is epic and disgusting. The NSA has disgraced and embarrassed the American people at home and abroad. The rampant criminality and antisocial behavior of America’s intelligence community has not only diminished American rule of law at home, but is leading to increasing friction internationally with our allies. It is well past time for us to reexamine the power of the NSA and friends. I have a dreadful lump in my throat! Despite the fact that people have been signing Petitions left and right, calling their Representatives all day long and days prior, sending e-mails, doing everything possible to avert an intervention in Syria, and despite the fact that the percentages against any intervention, ranging between 83% against and 17% for and, some at 74% against and 24% for, I fear it’s probably a done deal. And, once again, the American peoples’ responses have been/are being ignored . . . . .! As you know, TMC has informed you that Senate Committee passed an authorization to strike Syria. Here is an article you may want to keep (contains a graph showing how members have voted so far — we need to remember these people). Will Congress Support Military Action In Syria? As you will note within the article, Think Progress is keeping an Excel accounting of each Congressperson and his or her vote. But, next, you will understand my REAL reasons for believing it’s a done deal! It’s all about what we don’t know and, essentially, the only way you can learn or find out about what’s REALLY GOING ON is to go outside the country for information. While the first article I’m showing is alarming, to say the least, it is probably not that surprising to so many of us. The first cell of Syrian rebels trained and armed by the CIA is making its way to the battlefield, President Barack Obama has reportedly told senators. Strange, I’ve read a number of articles saying that there was absolutely no proof that Assad was gassing his own people and most speculated it was the “rebels” that were doing the gassing. But, as you know, we are not supposed to know who’s doing what to who . . . . only to blindly accept whatever is being “force-fed” us to believe! Please follow . . . ..
Having not yet recovered from the murder of Diamond Williams, Philadelphia's trans community was rocked again on Tuesday night. A 26 year-old transwoman is reported to be in critical but stable condition at Hahnemann University Hospital after being pistol whipped and shot in the back of the head in her apartment in Northern Liberties. She is expected to survive. 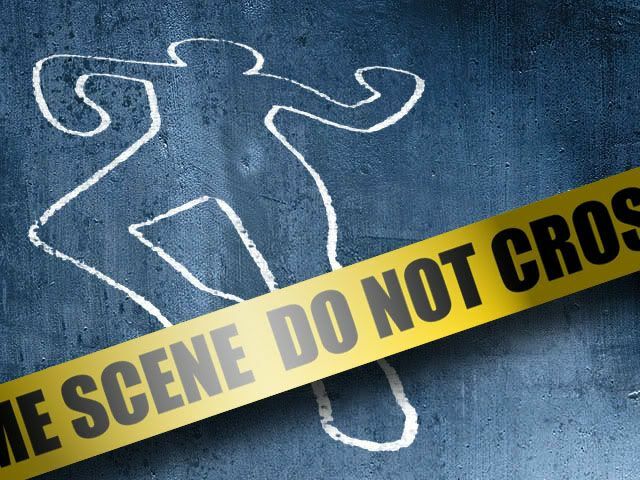 The victim was found at the front door to the apartment building, having crawled there from her third floor apartment. She was able to communicate with police when they arrived after being called by neighbors. She reported that she was waiting for a family member when she heard a knock on the door. She opened it to discover a man with a gun who she did not know. There is video here. That’s the CBS coverage, which describes the victim as a woman. Early ABC coverage described the victim as a “man dressed like a woman.” I saw video yesterday that identified the victim and had some interviews with family members, but it appears today to have been scrubbed from the internet.